We remember things that make us happy. A small gift from a friend, a place we had a nice meal, a kind word. Actually, the things or places are not special at all, but they are special to us because they made us happy. That connection, this = happy, is what we remember. In the same way, our brains remember words by their connections to other words. If you look at a word like “happy” think about how you can talk about that word. 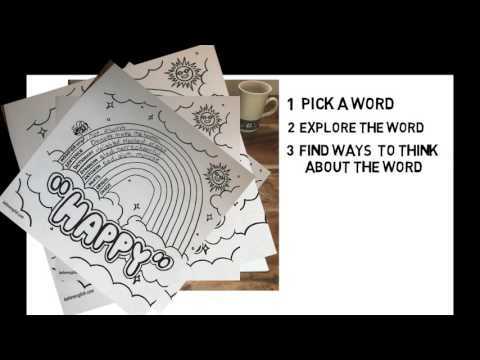 What words do you use to describe “happy?” These words are modifiers. How would you use happy in a sentence? Sentence: Donuts make me happy. What other words also mean happy? What words mean the opposite? Not happy. Is happy made up of more than one part? Where did the word come from? What is its origin? We don’t use “hap” by itself anymore, but a long, long time ago people did. Hap meant fortune or change in Middle English. You can still see it in Swedish and Norwegian words, and the English word “HAPpen.” What happened? Over time the word changed. The meaning became only about something good. First making somebody else feel good (happy, transitive verb) and then to describe feeling good yourself. That’s when “hap” became an adjective and the -y got stuck on the end. What do you see when you think about happy? ​2 Happy is in the book, but you can use any word . 4 Use each category in the rainbow to learn more and more about the word. Just​ like the first word you started the book with, one word, any word, can help you make connections to everything else in English. One word is easy. Use the word to increase your vocabulary and understanding of grammar. Simply. Word by word, step by step.